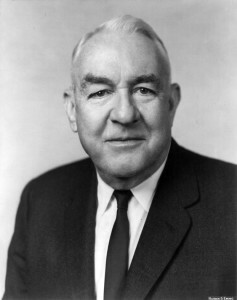 Ervin was a Democratic senator from North Carolina from 1954 until 1974. At the beginning of his Senate career, he served on the Senate committee that censured the anti- Communist “witch hunter” Senator Joseph McCarthy, but it was for his work at the culmination of his career, as chairman of the Senate Select Committee to Investigate Campaign Practices, known as the “Ervin Committee,” that he is best known. It was this committee that publicly investigated the Watergate scandal and brought down the presidency of Richard M. Nixon in 1974.